Why is it called “Not Made by Hands”? Because according to E. Orthodox tradition — and in E. Orthodoxy tradition is in many cases a part of accepted doctrine — Jesus once during his earthly life pressed a towel to his wet face, and his image — like a photograph — was miraculously imprinted upon it. That is the basis of the practice of venerating images — that the honor shown an icon by bowing and praying before it, by placing candles before it, by censing it with the smoke of incense, etc. — goes to the person depicted in the image. Now interestingly, that was precisely the belief of the non-Christians, the “pagans” who preceded Christianity in the Greco-Roman world, the Latin and Greek-speaking neighbors of the early Christians. They knew there were, for example, many images of the goddess Athena/Minerva in the world, yet they believed also that prayer before any image of her went to the goddess herself, who had a mysterious link with her images. And in E. Orthodoxy, the same mysterious link between image and person is also promoted. That is why it is common belief in E. Orthodoxy that an icon can be — as it is called in Russia — chudotvornaya, “miracle-working.” It is because of that mysterious link between icon and prototype. “We honor the venerable images [icons]. We place under anathema those who do not do this. Anathema to those who presume to apply to the venerable images the things said in Holy Scripture about the veneration of idols. Anathema to those who refuse to venerate with proper reverence the holy images of our Lord and His blessed saints. Anathema to those who say that Christians resort to the sacred images as to gods. Anathema to those who say that any other delivered us from the idols except Christ our God. Anathema to those who dare to say that at any time the Holy Church received and worshiped idols. Well, one can hardly get more definite than that. According to Eastern Orthodoxy, anyone who does not accept their doctrine of the making and veneration of icons is anathema, which means essentially accursed, separated both from the Church and from God, and to be condemned. That is the declaration of the Synodikon of the Seventh Ecumenical Council in the year 787 c.e. Notice how the authorities of the E. O. Church declared the making and veneration of icons — in retrospect — to be that of the Apostles. But what proof do they have for that? The answer is simple: none whatsoever. First, let’s take the notion that the E. Orthodox have an accurate likeness of Jesus that originated miraculously when he pressed a wet cloth to his face. This story is found nowhere in the Christian scriptures of the New Testament; not a hint of it. It comes instead from E. O. tradition, which in Orthodoxy often has a capital “T,” meaning it is regarded as infallibly accurate. But there are many things in their tradition that are not at all accurate. For example, look at most any E. O calendar, which lists the “official” saints and the days on which they are to be honored — in among them one will find a St. Ioasaph. Oddly enough, this saint never actually existed in Christianity. The story on which his existence is founded is just a reworking of the early account of the life of the Buddha — an account which came West on the trade routes, and was taken up and appeared in a much expanded Christianized version attributed (wrongly) to St. John of Damascus. Yes, attributed to the very same fellow who expounded the E. Orthodox doctrine of icons with such fervor. So paradoxically, the Eastern Orthodox who venerate St. Ioasaph on his annual day of commemoration — and who venerate his icons — are really honoring the Buddha, though the fundamentalists among them would never admit it. In other words, there is the story of the “Not Made by Hands” image and there is the E. Orthodox doctrine of tradition — that not everything significant was included in the New Testament, but those significant traditions have been handed down as part of the teaching of the E. Orthodox Church. The earliest mention of the story is in the Church History written by Eusebius of Caesarea in the 4th century. He remarks that King Abgar of Edessa sent a letter to Jesus at Jerusalem, asking Jesus to come and heal him of an illness. In this first and earliest version of the story, there is no image of Jesus mentioned. 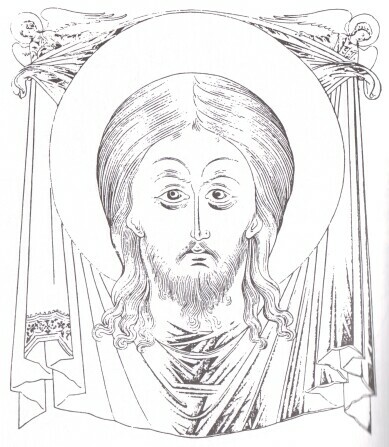 Then, in the later second account found in the Syriac Doctrine of Addai, there is mention of a painted image of Jesus in the story; and even later, in the third account, given by Evagrius, the painted image becomes instead an image that miraculously appeared on a towel when Christ pressed the cloth to his wet face. So this is the origin of the “real” miraculous image of Jesus. It is simply a fiction developed by modifying the same story over a long period of time, a story that came to be accepted in Eastern Orthodoxy as historical fact when it simply never happened. The truth about the origin of icons in Christianity is that the first Christians did not make or use them at all. There is not the slightest evidence for them in earliest Christianity, and of course, given their importance later, it is noteworthy that the making and veneration of icons by Christians is nowhere mentioned in the New Testament. In fact when the first Christian art did appear, it was in the form of decorative symbols and simplified images that call to mind biblical stories. We know that from both the archeological and the literary evidence. The impression given by this excerpt is only confirmed by other literary and archeological evidence. When venerated icons first appeared (as opposed to symbolic and narrative images), it was among “pagans” converted to Christianity, pagans who brought their tradition of image veneration with them and simply applied it to the “new” religion. Later, with the masses that flooded into the Church after the legalization and promotion of Christianity under the Roman Emperor Constantine, we find the beginnings of the first real rise of the making of “portrait” images of Jesus and the saints, and their eventual veneration. Essentially, then, the making and veneration of images is simply the old “pagan” — that is, non-Christian — practice of image veneration, which was increasingly adopted into a developing Christianity after a heavy influx of “pagan” converts. An ancient pagan would have been quite at home venerating icons of various saints that took the place of the old gods, lighting candles before them, ornamenting them with garlands and wreaths, bowing, and offering incense. That was precisely the way “pagans” were accustomed to venerate their deities. In fact the practice of Lycomedes in the excerpt from the Acts of John illustrates the usual polytheistic practice of having a votive image painted of the deity who had bestowed a gift on the worshiper, placing it in a shrine, and honoring it with lights and garlands. Such votive images were ancestors of Christian icons. The only thing that would have made a “pagan” uncomfortable would have been the notion that only the Eastern Orthodox had it right, and that all other religious images made and venerated outside of E. Orthodoxy were somehow “evil.” Polytheists were far more tolerant than Christians in such matters. Read in that sequence, Jensen’s books give a factually-supported account of the first Christian art and the eventual rise of the Christian “portrait” that gave birth to the practice of the veneration of images formalized later in the Eastern Orthodox doctrine of icons. Another useful book on the subject, but more complex in its organization, is Hans Belting’s Likeness and Presence: a History of the Image before the Era of Art, University of Chicago Press, 1994.